site has been launched in response to the Australian government's moves to raise the retirement age – and the fact that more than half the NRMA's members are over 50. The site, created in partnership with Sydney content marketing agency King Content, includes a jobs portal specifically to connect mature jobseekers with employers, and provides interview preparation support. Craig Hodges, CEO and founder of King Content, said: “The over 50s are largely ignored by publishers and advertisers in Australia, and as a result there is a lack of intelligent information available for a segment that is actively searching for content on their career and lifestyle. 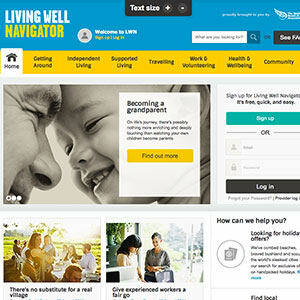 The NRMA has launched a website solely for the over 50s, full of lifestyle, health and employment tips. The Living Well Navigator site has been launched in response to the Australian government's moves to raise the retirement age – and the fact that more than half the NRMA's members are over 50.